I feel like it's been forever since I posted something. Work has slowed down but we've had a whirlwind of family functions this month. If it's not one thing it's another. Sheesh. Not that I'm ungrateful for the time I get to spend with my family but if I could just sneak in a day where I got to sleep as much as I wanted and maybe got to read 3 books that'd be fantastic. Said every Mom ever. While I haven't been posting I have still been creating. Some. I'm hoping to sneak in a Periscope either today or tomorrow. Cross your fingers. In the meantime I have two videos that I've shared in the last week. I've included links in case you're interested in checking them out. The first is over on the Simon Says Stamp blog It really concentrates on getting dimension with masking as well as coloring your images to be transparent. 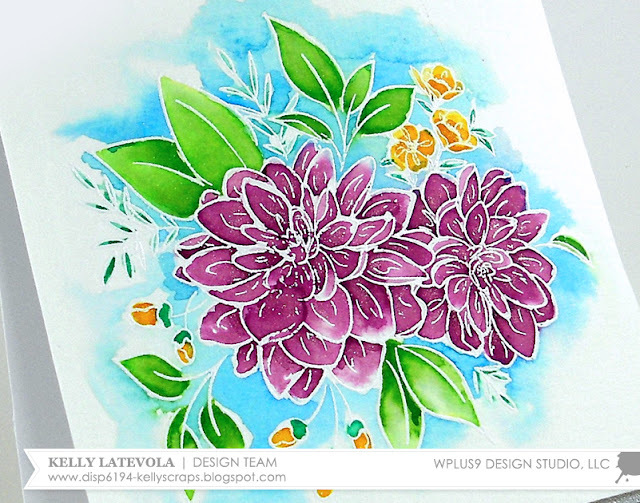 The second video I shared at the WPlus9 blog This time I watercolored with distress ink after some heat embossing. I talk a lot about color selection. I don't have time to actually read books anymore either so I have to enjoy them through listening. I use the Overdrive app...let's you check out audio books using your local library card. It is fantastic! Before I retired, I used books on cd to combat frustrations with my long commute, no longer was it wasted time. Enjoyed the balloon video, and looking forward to the dalhias. Very pretty cards Kelly - love the colours on your flowers - so rich! I love these cards - I oohed and ahhed over them when I saw them on the other blogs - so beautiful and the coloring and the color that bursts and brings things to life!! You are, and always will be a coloring ROCK STAR!!! Two amazing cards, Kelly! I can't wait to go check out the videos.